Check this out! One of my favorite people is sponsoring a contest where you have the chance of winning this fab necklace. Ki, at Junk Revolution, is the one offering it. All you need to do is go to her website at junkrevolution.com, post a comment and you have a chance to win! You also will have to check out her blog, junkcamp.blogspot.com, where she has some awesome ideas and info. I am fortunate enough to be again part of her annual Junk Bonanza sale that will be coming up in September as well. Check that, too, and good luck! I'm glad to see you are doing the Bonanza again this year. We hope you will be joining us in St. Charles in June for our Vintage Treasures Market! Hi, Marge! Hope all is well with you. I got the info but haven't had a chance to really look at it. I was in Buffalo last week with my family, and now headed to Texas. I think I need a break from vacations!!! Are you doing the Bonanza again? 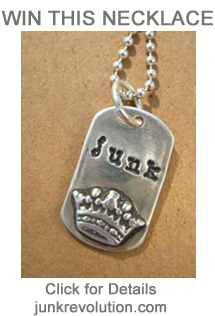 I love how the necklace says junk and has a crown on it. That's so cute.